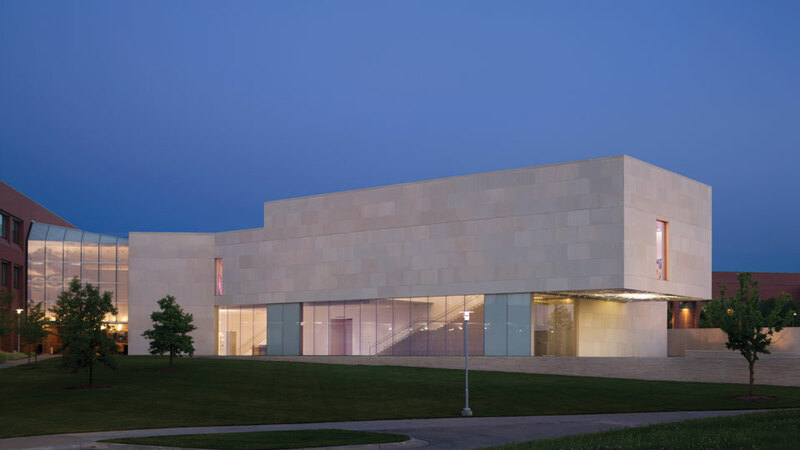 We invite you to visit the Nerman Museum of Contemporary Art (NMOCA) to experience the art of some of the top internationally acclaimed and upcoming artists of today. To learn about the museum and the art, arrange for a guided tour (recommended for groups or 10 or more), or use our resources for a self-guided tour. Enter campus using the entrance on Quivira Road immediately south of College Boulevard. Buses may drop off visitors at the museum’s driveway and park in any open lot on campus or at the shopping center across the street. Buses may pick up visitors at the same location. If driving individually, please allow at least 15 minutes for parking; parking is free. The museum has limited designated parking, but there are parking garages near the Carlsen Center, adjacent to the Regnier Center and on the south side of campus (the Parking Garage at Galileo's Garden), as well as surface lots. K-12 groups may request assistance with bus funding. The campus has many outdoor locations suitable for picnic lunches. If your tour group is interested in having lunch in the museum at Café Tempo, café management (ext. 4990) can answer any questions you have regarding that component of your visit. Café Tempo is open from 7 a.m. to 3 p.m. Monday through Friday (7 to 10 a.m. breakfast; 10:30 a.m. to 2 p.m. lunch; and 7 a.m. to 3 p.m. coffee, pastries, desserts) with catering options on evenings and weekends. Meeting rooms and conference spaces are available. Rental fees apply.